On Nov. 1, Mike Vitulano, who served as assistant technical director at the Quebec Soccer Federation, was officially appointed as technical director of the Manitoba Soccer Association. As technical director, Vitulano will oversee soccer operations across the province. The opportunity was appealing but he admits that it took a bit of time to make his mind for family reasons. Vitulano was contacted in May by former technical director Marinos Papageorgopoulos, who was leaving to take a position with the Vancouver Whitecaps of Major League Soccer. Both men met in Montreal in late June coming face-to-face for the first time. The head coach of the Canadian futsal national team and friend of Vitulano’s, Kyt Selaidopoulos, describes him as “one of the best in the business, with futsal and soccer.” The news of Vitulano’s departure didn’t surprise him. “We always knew that this was going to happen at one point, that it would be him leaving or I leaving,” said Selaidopoulos. His work as assistant coach of the national Canadian futsal team during its run in the 2016 CONCACAF Championship surprised many. Led by Selaidopoulos and Vitulano, the team upset the United States and came one win short of qualifying for the futsal world cup. Selaidopoulos didn’t consider his work with the national team the only boon to Vitulano’s stock. He cited Vitulano not as an assistant but as a coach equal to him. Vitulano thinks the international competition experience he gained is what he got the most from his time with the national team. He got a direct look at how teams from the rest of the continent operated. “You have discussions with coaches, you learn from it and you try to take two or three ideas and you say: ‘This wouldn’t be realistic for Canada, but this idea might work for us,’” said Vitulano. Both men expect Vitulano to continue with futsal despite his new position. He believes that futsal—given the Canadian climate and many resources—can be a great tool for the youth to develop into more wholesome soccer players. The plan might take the back burner for now but both Selaidopoulos and Vitulano have been discussing the subject. One of the appealing parts for Vitulano, however, was the fact that Quebec and Manitoba have very different soccer landscapes. While the two provinces are similar geographically, Quebec has 200,000 members in its soccer-playing ranks; Manitoba has about 16,000. “It’s two different ballgames,” explained Vitulano. The structure to run Manitoba Soccer was put in place by former technical director Papageorgopoulos only two years ago. For context, in Quebec a structure was developed eight to ten years ago; part of Vitulano’s former job was to maintain it. For him, that is the nature of the challenge: coaching, education and adding to the province’s structure. The new position is a move up for Vitulano but it is also an opportunity for a Quebecer to take a higher position out of province. He is not the only one to have jumped for a new challenge. David Cerasuolo, who had been coaching at the Quebec Soccer Federation’s Centre National de Haute Performance, accepted in August an offer from the Vancouver Whitecaps. 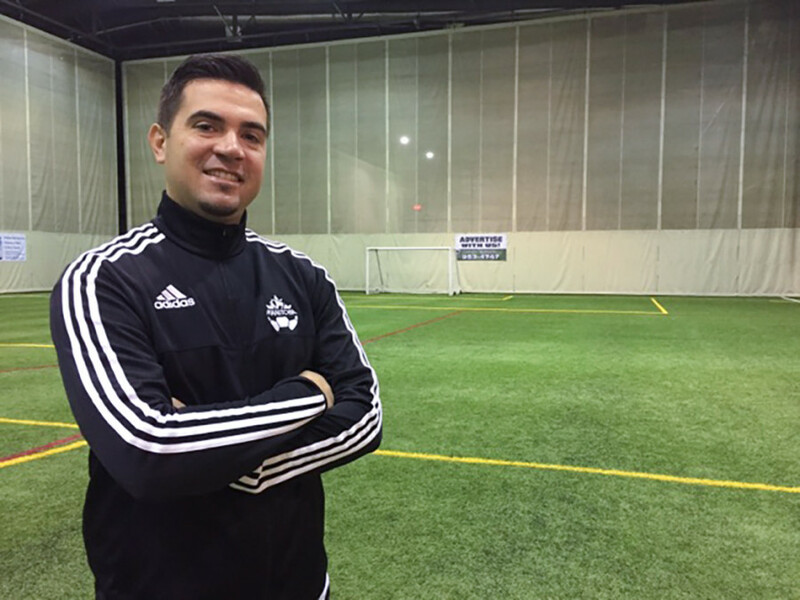 The former Concordia Stingers women’s soccer assistant coach has since been the head coach at the Whitecaps’ academy centre in London, Ont. Unlike usual soccer jobs where you need to apply, Cerasuolo was referred to by a colleague and one day received a call from the Whitecaps. “I appreciated the environment I was in Quebec but I was always looking for challenges out there, what can potentially be of interest,” said Cerasuolo. “It’s always nice to know that your name hits the radar and that a professional club is interested in you. For Vitulano, the size of the Quebec soccer landscape—200 clubs spread throughout 18 regional associations—makes coaches desire higher positions. “I think people from Quebec are able to go elsewhere because they are used to this big structure of regional associations and say: ‘These are thing I learnt in Quebec, maybe we can’t apply this and this, but we could definitely apply this and this,’” said Vitulano. By seeing Quebecers taking on big roles in other provinces, it can be seen as a tip of the hat to the current level of coaching in the province. When looking for the best available, more employers turn towards Quebec’s local coaches. Higher positions are rare commodities and not everyone can grab those. Looking elsewhere becomes more interesting. Despite thinking that more Quebecers might rise to the top elsewhere, Selaidopoulos thinks that the Quebec Soccer Federation should look into keeping its local talent. “I think that we, Quebec, should look at our plan and see how we can keep all these people in place with new challenges and new visions or new projects that could be interesting for coaches—even myself,” said Selaidopoulos. The call for opportunity is also a big aspect for coaches in a big federation. Having coaches chase opportunities may have a door-opening effect for other local coaches pursuing opportunities of their own.